How secure is your Application Whitelist? 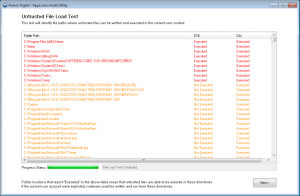 Application Whitelist Auditor is a free utility developed by Airlock Digital designed to comprehensively audit application whitelists for weaknesses, regardless of vendor. It performs automated file load tests and identifies policy weaknesses that can be exploited by attackers. 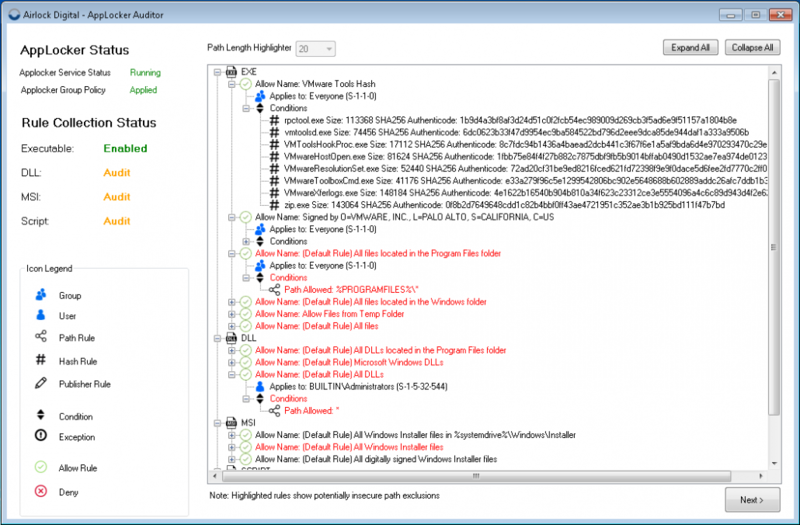 Application Whitelist Auditor includes a mode to audit both Microsoft AppLocker™ deployments and Windows Defender DeviceGuard™ / Application Control and displays complex policies and associated problems clearly. You can view an example HTML report generated from the tool from an AppLocker™ deployment here. The utility is designed to be run as a standard (non-privileged) user. 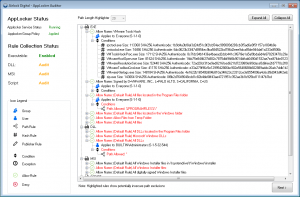 View AppLocker rules in a simple single tree view. Potentially weak rules are highlighted for review. 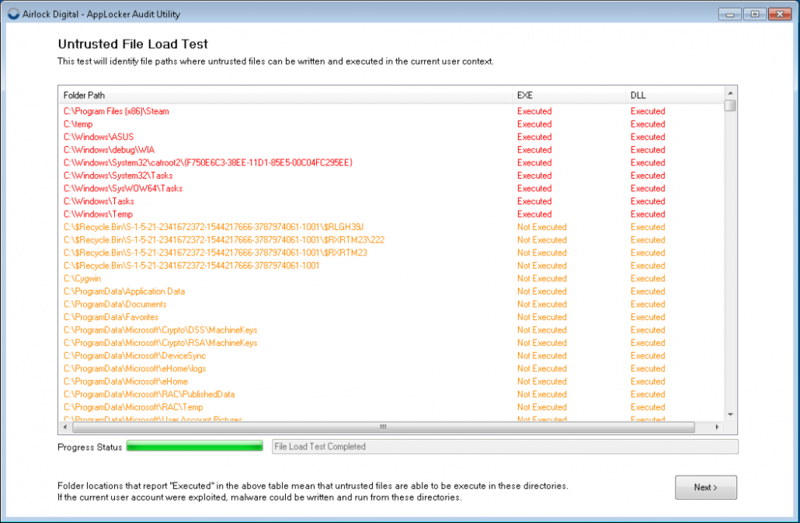 Perform an actual file load test and identify where un-trusted EXE and DLL files can run on your endpoint. Check your application whitelist compliance against the Australian Signals Directorate ISM Requirements. 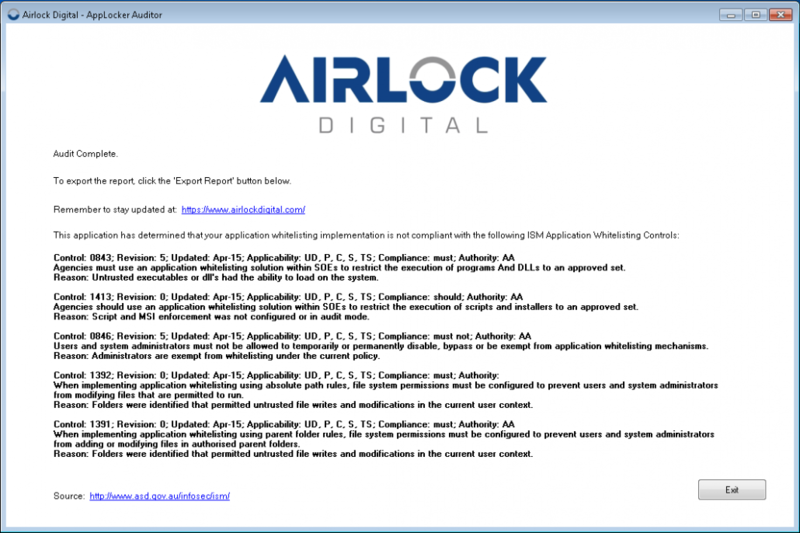 AIRLOCK DIGITAL – APPLICATION WHITELIST AUDITOR IS PROVIDED “AS IS” AND THE AUTHOR DISCLAIMS ALL WARRANTIES WITH REGARD TO THIS SOFTWARE INCLUDING ALL IMPLIED WARRANTIES OF MERCHANTABILITY AND FITNESS. IN NO EVENT SHALL THE AUTHOR BE LIABLE FOR ANY SPECIAL, DIRECT, INDIRECT, OR CONSEQUENTIAL DAMAGES OR ANY DAMAGES WHATSOEVER RESULTING FROM LOSS OF USE, DATA OR PROFITS, WHETHER IN AN ACTION OF CONTRACT, NEGLIGENCE OR OTHER TORTIOUS ACTION, ARISING OUT OF OR IN CONNECTION WITH THE USE OR PERFORMANCE OF THIS SOFTWARE.